Below are our workshop leader’s answers to a selection of frequently asked questions about thermoplastic injection. How long does it take to design a mould for thermoplastic injection? 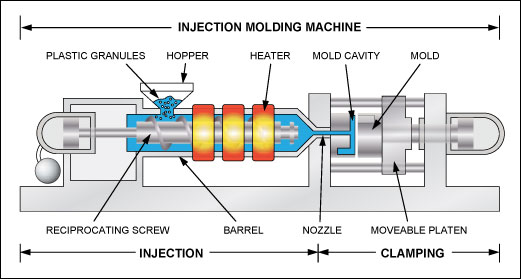 Creating an injection mould requires between 5 and 12 weeks. The production time of the mould for thermoplastic injection depends on the complexity of the mould. The mould is composed of two halves, a fixed part and a moving part. If the geometry of the parts is complex, it will be necessary to add movements (demoulding of undercuts) to remove the part from the mould. Ribs may also be inserted to provide mechanical reinforcement. The ribs increase the complexity of the injection mould and the production time. It is possible to reduce the manufacturing time by simplifying the design of the mould. How many plastic parts can be produced with an injection mould? Thus, the lifetime of the injection mould depends on its quality and the materials used during its manufacture. These materials have a strong impact on the price. However, they must be selected primarily according to the technical needs. In addition, the heat treatments applied must be chosen according to the steels. It is essential to find the appropriate treatments at the risk of destroying the impressions. Taking care of the mould makes it possible to increase its lifetime and the number of parts that can be created. What parameters determine the price of a plastic injection mould? The number of impressions: the simpler the design of the injection mould, the lower the price. The type of material used to make the injection mould. This depends in particular on the quantity of parts to be produced. In general, aluminium will be cheaper than steel. The type of injection required. If you are hesitant about choosing this technology for your project, you can consult the advantages and limitations of thermoplastic injection.